This is a Jamaican citrus fruit that was created by hybridizing a grapefruit with a tangerine. Its name derives from the unsightly appearance of its rough, wrinkled, greenish-yellow skin that is loosely wrapped around an orange pulpy citrus fruit inside. The green surface blemishes turn orange when the fruit is ripe. 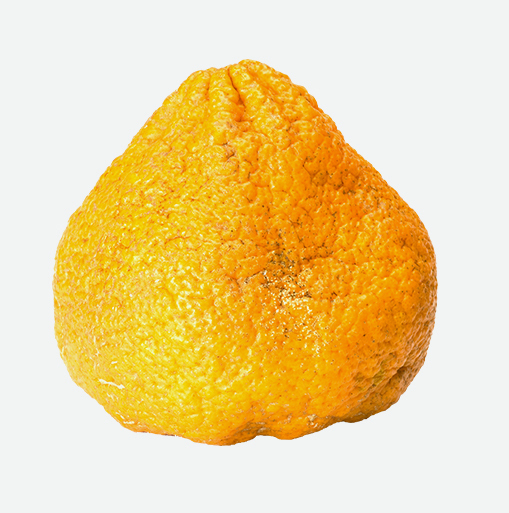 Ugli fruits are larger than grapefruits and they have fewer seeds. Ugli fruits are also called “exotic tangelos”. Ugli fruit is low in calories for individuals watching their weight. It is a source of dietary fiber and a great source of vitamin C which helps in the formation of healthy teeth and gums. Choose fruits that are heavy for their size and display no sign of drying at the ends. The fruit should give with slight pressure much like grapefruit. Colour is not important when choosing, and pot-marks and small dents are normal. Ugli fruits can be at room temperature for about 5 days or refrigerated up to 2 weeks. This fruit is great for juicing. Sipping a glass of ugli juice is a refreshing, delicious change to the usual orange or grapefruit juice. Ugli juice is also flavourful when it is warmed as a hot toddy with a splash of rum and sweetened with honey or brown sugar. Peel, slice away the pith and cut out the segments to use in a salad, as a cheesecake topping, or on its own as a dessert drizzled with sherry or Kirsch. The peel and juice together make marvelous marmalade.